This Virtual Tour gives you a glimpse of Dali’s precocious talent, persistent obsessions, humor, edginess, and beauty – from iconic melting clocks to imaginative visual illusions and avant-garde symbols. The Dali Museum’s collection is in rich in works from artist Salvador Dali’s entire career (1904-1989), with key works from every moment and in every medium of his artistic activity. For those visiting the Museum, this app can be downloaded on your own device as you tour through the galleries, and for those who can’t visit, yet, experience The Dali virtually. Tour over 30 works of Dali’s from our permanent collection, in English, Spanish, German, French, Portuguese and Russian. The app also features engaging challenges for kids and adults — test your Dali knowledge after you’ve taken the tour. Available for iPhone at www.itunes.apple.com and Android at www.play.google.com. If Salvador Dali created an app, would it capture contradictory conditions between the real and the subconscious? The Staring Contest turns a two-person game into a digital one that gives users the illusion of having an actual opponent. Players pick their battles against Dali himself and other felicitous characters, such as a loaf of bread or a giraffe. Available for iPhone at www.itunes.apple.com. For more information, visit www.staringapp.com. Go inside and beyond Dali’s 1935 painting Archeological Reminiscence of Millet’s “Angelus” and explore the world of the surrealist master like never before. Adventure into the towers, peer from them to distant lands, and discover surprises around every corner—in a way we can only imagine Dali may have dreamed. The Dali’s building combines the rational with the fantastical: a simple rectangle with 18-inch thick hurricane-proof walls out of which erupts a large free-form geodesic glass bubble known as “the enigma.” Inside is a helical staircase recalling Dali’s obsession with science. The gardens create a unique environment of learning and tranquility. 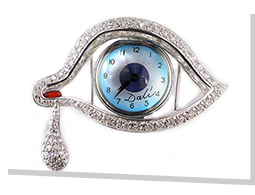 The Store features the largest collection of Dali-inspired merchandise in the world. Cafe Gala offers Spanish-themed light fare with indoor and outdoor seating. And of course, the galleries – which house an unparalleled collection of Dali art from every artistic moment of his career.